Westbrook’s Savannah Marshall is coached by her mother, Kelly Landino, a former standout at both Platt and the University of Hartford. Savannah’s father, Donny Marshall played for UConn and in the NBA. 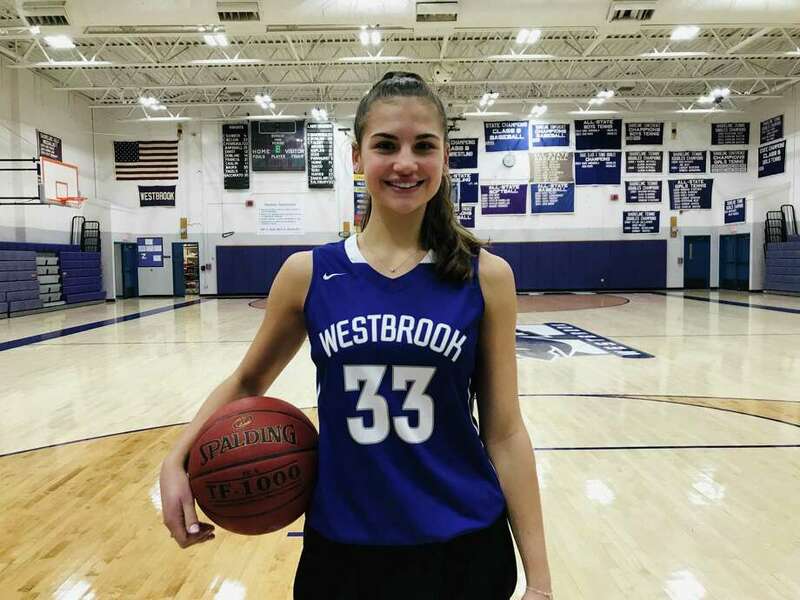 While most girls basketball players around the state prepared for the upcoming season this past fall by training or playing fall ball, Westbrook senior Savannah Marshall was following another passion. It was not a fling for Marshall, who has taken part in school musicals every fall since entering Westbrook as a freshman. Coming from a family obsessed with sports and after playing basketball all winter for Westbrook and most of the spring and summer in AAU, Marshall considers the musicals a much needed respite from hoops. Marshall is not overstating the athleticism in her family. Her mother, father, grandfather, aunt, uncle and cousin all played sports in college and Marshall plans to do the same, committing to play basketball at Sacred Heart University next year. Her father is former UConn men’s basketball player Donny Marshall, who played for the Huskies from 1991-95 and for five years in the NBA with the Cleveland Cavaliers and the New Jersey Nets. Her mother is Kelly (Penwell) Landino, a standout player for Platt High School in Meriden who went on to play for the University of Hartford. She is a member of the Connecticut Women’s Basketball Hall of Fame. Landino is also Savannah’s coach at Westbrook and has been coaching her daughter since Savannah began an after-school program in Chester, where they lived at the time, when Marshall was in first grade. Landino continued coaching Marshall through parks and recreation, travel and AAU teams, then eventually at Westbrook. Marshall moved to Westbrook in sixth grade and a year later, Landino took the Westbrook varsity coaching job, temporarily passing Marshall off to coach Scotty Nails and the Connecticut Basketball Club AAU program in middle school. She and Donny Marshall are divorced, with Donny now living near Storrs, though he comes to see Savannah play throughout the season. Marshall gets aspects of her game from both parents. Nails told Marshall if she wanted to take her game to the next level and play in D-I, she had to get serious about defense. Nails said that while Marshall obviously comes from an exceptional basketball gene pool, she has forged her own path in every way. Being coached by a parent might make compartmentalizing difficult for some, but Marshall and Landino are able to separate basketball and family. Now that Marshall has a driver’s license, she leaves after games with friends, eliminating some of Landino’s favorite time she used to spend with her daughter: the drive home from games. Landino said the drive home used to be the perfect way to discuss the game before leaving it at their door, but now the basketball creeps into the house occasionally. “There is some overlap. Before she got her license we would talk basketball the whole way home and then as soon as we got home, I’d turn into mom. I have a younger daughter, too and life kind of happens when you walk through the door,” Landino said. Marshall is not only a good kid, but a star basketball player in the Shoreline Conference, where she has scored over 1,300 points with 500 rebounds an counting in her career. She has been named first-team All-Shoreline three times and New Haven Register All-Area and CHSCA All-State twice. This season, despite facing gimmick defenses designed to slow her, she is still playing at an all-state level. Teams have not only thrown box-and-ones at her, but also played a triangle-and-two with two players blanketing Marshall, at times. Last week against Old Saybrook Marshall had a career-high 40 points along with 16 rebounds and 12 steals for a triple-double in a 58-43 win. Marshall has collected all the personal accolades, but has team goals in her sights. Westbrook did not make the Class S tournament last season after going out in the second round her sophomore season. Qualifying for the Shoreline and Class S state tournaments are very important to Marshall. If her previous accomplishments are any indication, Marshall can certainly lead Westbrook to the postseason. Next year she will not only be playing basketball at Sacred Heart, but hopes to pursue theater as a minor as well. Because that is her own little thing.